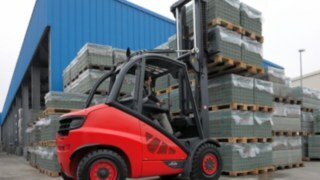 After experiencing major health and safety incidents across sites in mainland Europe, it was decided by the Chief Executive of Ibstock Building Products to control speeds of reversing forklifts. Linde worked very hard with their design engineers in Germany who came up with an ultrasonic system which they developed and tested extensively. This system initiates a slow-down, starting at three metres when the system on the truck will detect an object (the detection zone). At two metres, if the operator continues to back towards the object it will start to slow the truck down, until the one metre zone where the truck will be operating at just one kilometre per hour. An audible and visual warning to the operator also ensures he is aware there is an object behind or to one side of him so appropriate action can be taken. Product Manager David Bowen from Linde commented “This has not just been a relationship between two companies, this has been very much a personal relationship, we’ve all worked together to contribute towards the system we have today.